Usually, I make gnocchi from scratch because it’s not that hard and it’s fun for kids to roll out the ropes and cut the pieces. Think play-doh that you can eat. But last weekend, I spent a blissful weekend in Los Angeles with my friend Melissa Clark (the novelist and creator of BraceFace, and blogger, but not the food writer! ), and while we spent a lot of weekend eating out (which I’ll write about soon), we spent a lovely lazy Friday night drinking beer on her deck, overlooking the gorgeous spreading beach of Marina Del Rey, watching the sun set. 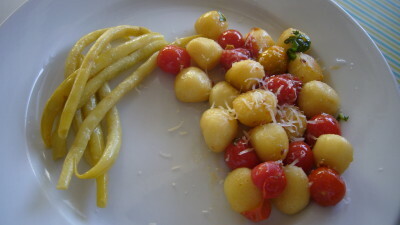 She cooked me gnocchi with cherry tomatoes and basil, but the difference was that she pan fried them, something I’ve never done, and she used prepackaged gnocchi. (She got the idea from 101 Cookbooks). It was delicious, and so when I was in Trader Joe’s upon my return, and saw that same red package of gnocchi, I grabbed it. I’ve tried packaged gnocchi before, and they weren’t good. But these are. I fixed them for dinner last night and pretty much had to keep the kids from eating the whole batch so Kory and I had something to eat when he got home. The kids ate most of the corn, too, so I took the small amount left off the cob and tossed it in our gnocchi. This is really, really fast. Maybe 10 minutes to the table. Another good one when you’re pressed for time. Which is pretty much every day these days. 4-5 leaves basil, shredded, choppped, or in a chiffonade–or whatever herbs you have on hand and like. Experiment with parsely, oregano, tarragon, chives…. Optional: 1 ear of fresh corn, cooked, cooled, and kernals cut off. Mince the garlic & sautee in a couple of tablespoons olive oil and butter in a large sautee pan Add the gnocchi to the pan & cook until heated through and lightly golden brown. Toss in the tomatoes and cook until they’re warm, but a little wilted. Toss in the basil. If you’re using corn, toss it in now and give a stir. Toss in the basil. Serve with grated cheese. Seriously, that’s it. I plan to keep a package of gnocchi on hand all the time. It’ s not exactly as blissful eating it at home as it was on Melissa’s deck, but I’m eternally grateful to have such a great friend in my life, and this new recipe will remind me of her every time I cook it. My kids are grateful too. Yeay!!!! Glad you made it and liked it and that the kiddies liked it, too. Come back for more asap!